Well, if you ever had time to read huge classics, Peace Corps service is it. Especially since my kindle informed me it was a 10 hour book. And well, it took me a little more than that. Almost a month I think. Which was quicker than I expected because, well, Adam's book was not what I expected. I thought there would be lots of description and boring prose, with much of the action being in the form of thought since so many people go on about the mean of this novel. And yes, I skipped a page or two (I don't need to read 500 words on the geographical features of the down), but I fell right into the story. Hazel and his rabbit friends are great characters, and I found myself fully involved in their journey from Fiver's first vision. Each challenge they meet was unique, and each solution doubly so. Adams created a huge world of possibilities, from human-rabbit interactions to rabbit-rabbit relationships, and adding rabbit myths along the way was wonderful. I loved Dandelion's stories! I also loved Adma's way of describing things, such as the railroad and paved highways. I knew what they were, but seeing them from a rabbit's point of view was amazing. 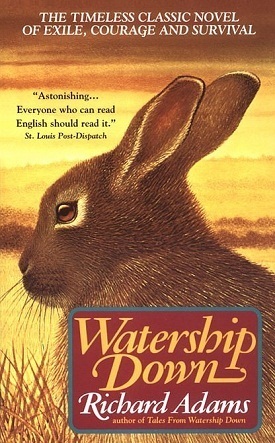 Once or twice I didn't get it at first, but that was okay because as I read this book I wasn't Gwen the human on her bed, I was Strawberry and Cowslip and Hazel and every rabbit in the travelling warren. I was searching for a new home and avoiding foxes just like them. And when I finished, I felt ashamed for not picking up this book years before. My sister discovered it in middle school. I've been missing out for so long!